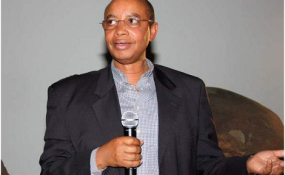 Rwanda fugitive and former Spy Patrick Karegeya (file photo). There is a chance justice may still happen for the killing of Colonel Patrick Karegeya, a Rwandan dissident who was found murdered in his hotel room in Johannesburg, South Africa, on January 1, 2014. The inquest into Karegeya's murder started today, January 16, in Johannesburg. No one has been charged and the primary suspects have fled the country, but Chief Prosecutor Yusuf Baba plans to hear from 30 witnesses, including the police officers who investigated the case and hotel staff. Karegeya's nephew, David Batenga, was the last to see the Rwandan exile on the day of his death. "It's been far too long that we have been waiting for this day. I hope justice will prevail," Batenga told Human Rights Watch. Once the inquest is completed, Baba will decide whether or not to refer the case for criminal charges and trial. From 1994 to 2004, Karegeya was the head of Rwanda's external intelligence services. He was imprisoned twice, in 2005 and 2006, before he fled to South Africa in 2007. There he was joined by former army chief of staff Kayumba Nyamwasa, and the two founded the exiled opposition party the Rwanda National Congress (RNC). Nyamwasa survived an assassination attempt in South Africa in 2010. The risk of threats, enforced disappearances, unlawful arrest, detention, and torture for political dissidents in Rwanda remains all too real. Many former officials of the ruling Rwandan Patriotic Front (RPF) who have turned against President Kagame have been the targets of attacks and threats in recent years, although the government has consistently denied any involvement. On January 14, 2014, days after Karegeya's murder, President Kagame's office on Twitter: "Those who criticize Rwanda know how far they go to protect their own nation." The same day, Kagame had made a public speech in which he came close to condoning Karegeya's murder, saying that "those who betray the country will pay the price." The inquest into Karegeya's murder is an important step towards accountability. The Rwandan government should cooperate fully with the investigation. In the meantime, countries that host Rwandan refugees and asylum seekers, who continue to have well-founded fears for their safety, should ensure their protection.